New Zealand and Fiji Muslim football players and officials after the FANCA final at Church Park, Lautoka on August 05, 2018. New Zealand beat Fiji 1-0 in the main final. Photo: Yogesh Chandra. 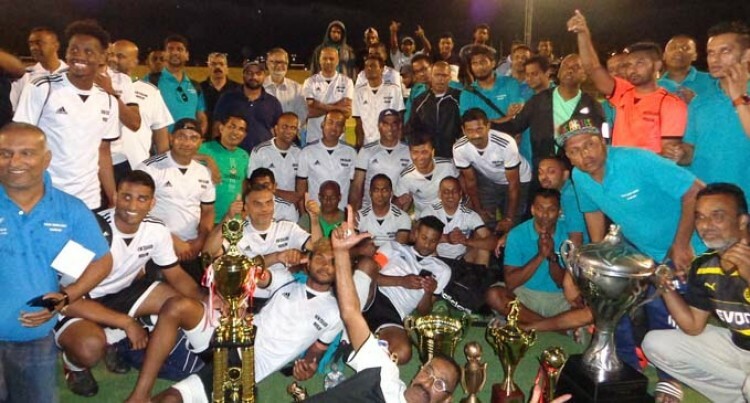 The New Zealand Muslim football team were last night crowned the Fiji, Australia, New Zealand, Canada, America FANCA Muslim Football tournament champions. This was after they beat Fiji 1-0 at Churchill Park in Lautoka. New Zealand captain Fitsun Aden said they had many scoring opportunities but only managed to put one goal in. “Fiji did apply some pressure in the second half,” he said. The crowd got to the edge of their seats when Fiji scored a goal in the dying minutes of the game. However the goal was disallowed by the referee. Fiji assistant coach Imraan Ali said the missed a lot of opportunities in the first half which affected them. Team manager Mohammed Mohin Rafiq said poor finishing was their drawback. Meanwhile, in the Over-35 final New Zealand walloped Fiji 4-1 to claim the top spot.